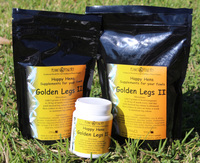 Happy Hens "Golden Legs II". Xanthophyl in a carrier of processed cereals and vegetables, soy protein, whey protein, malodextrin, glucose, lysine, methionine, mannan oligosaccharides, B-glutons, vegetable oils, omega-3 & omega-6 fatty acids, taurine, carotenoids, vitamins A, B1, B2, B3, B5, B6, B9, B12, C, D3, E, K, biotin, choline, inositol, calcium, phosphorus, potassium, sodium, magnesium, zinc, iron, manganese, copper, iodine, selenium and antioxidants, to enhance the leg colour in yellow legged birds. Directions: Add 5 grams (1 level teaspoon) to 20 kg of mash every 2nd day until desired leg colour is obtained then reduce to once or twice a week to maintain leg colour. Ingredients: Xanthophyl in a carrier of processed cereals and vegetables, soy protein, whey protein, malodextrin, glucose, lysine, methionine, mannan oligosaccharides, B-glutons, vegetable oils, omega-3 & omega-6 fatty acids, taurine, carotenoids, vitamins, minerals and antioxidants. Caution: Directions for use should be correctly followed otherwise it may not only colour the legs but may also colour the feathers. Should not be used when birds are moulting as it may colour the feathers in white birds.